Hardcover, 9.5 x 11.75 in. / 160 pgs / 45 color / 89 bw. The making of Josef Koudelka's famous photobook Exiles: like a "director's cut" this new book reproduces previously unpublished photos, captions, archival documents and shows how the book was put together. Josef Koudelka was born 1938 and came to fame with his 1968 photographs of the Soviet invasion of Czechoslovakia -- after which he fled the country and lived for decades as an exile. He is a member of Magnum. Koudelka has exhibited at the MoMA and at the ICP in New York and the Art Institute of Chicago. ABOUT THE AUTHOR: Clement Cheroux is senior curator at SFMOMA. He is currently preparing a Walker Evans retrospective that will be presented at both SFMOMA and the Centre Pompidou. He was a visiting research fellow in the Art History Department at Princeton University and a guest scholar at the Getty. In 1988, Josef Koudelka published what was to become one of his most famous and canonical series: Exiles. These gorgeously austere black-and-white images described the travels and everyday life of the peoples he encountered while roaming Europe. Josef Koudelka: The Making of Exiles is an exploration of the genesis and the making of this photographic journey. 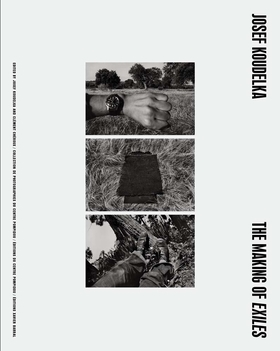 Enhanced by numerous photographs that have never been published—in particular the photographer’s self-portraits—and captions by Koudelka, it includes numerous archival documents (such as reproductions of his travel journals), thumbnail reproductions of the book’s layout, an introduction by curator Clément Chéroux and an essay by photo-historian Michel Frizot, who spent hours interviewing Koudelka. Josef Koudelka was born in Moravia in 1938. Initially an aeronautic engineer, he launched full time into photography in the late sixties. In 1968, he photographed the Soviet invasion of Czechoslovakia, publishing the results under the pseudonym P.P. (Prague Photographer). Koudelka left Czechoslovakia in 1970 and was briefly stateless before obtaining political asylum in England. Shortly afterwards, he joined Magnum Photos. In 1975 he published Gypsies. Koudelka has exhibited at the MoMA and at the International Centre of Photography in New York, at the Hayward Gallery in London, the Stedelijk Museum in Amsterdam and the Palais de Tokyo in Paris. ...In this new volume, rich personal details illuminate a photographer who, like many of his subjects, thrives in the margins. 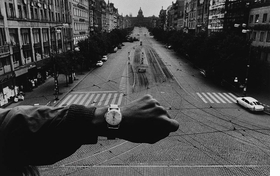 Prague, Wenceslas Square, August 22, 1968: An arm is thrust into the picture. The watch on its wrist indicates the time. The forearm is not raised vertically as in the usual Communist-style revolutionary gestures. It is stretched out horizontally, parallel to the bottom edge of the picture. The fist, however, is clenched as if this were a protest with the weapon of time. In the days before, tanks of the Warsaw Pact had entered the city to the screech of Caterpillar tracks on the cobbles. The image became iconic and Koudelka described it as “the photograph that was symbolic of Exiles;”(3) as if that August day in 1968, perhaps that precise moment, had marked the start of a countdown that would eventually lead the photographer to leave the land of his birth. 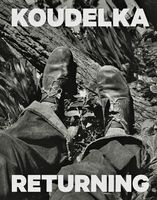 In 1970, in fact, while on a trip abroad, Josef Koudelka decided not to return to Czechoslovakia. It was the beginning of years of exile, which he spent on the road, traveling wherever in the world fortune led him. 1. Josef Koudelka, Prague, 1968, Paris: Centre National de la Photographie, 1990; Josef Koudelka, Invasion 68: Prague, New York: Aperture, 2008. 2. Josef Koudelka, Exiles, New York: Aperture, 1988. 3. Interview with Josef Koudelka by Clément Chéroux, Fondation Henri Cartier-Bresson, May 21, 2015. FORMAT: Hbk, 9.5 x 11.75 in. / 160 pgs / 45 color / 89 b&w.